You can add multiples in the checkout if you require more. The importance of coaching as a life-skill has occupied the minds of many far greater than mine. Whether as manager, leader, coach, consultant, facilitator, friend, parent or teacher, supporting and challenging people to discover ‘their’ way of doing something remains as important as ever in this VUCA world. Hardly any wonder then that there is a plethora of books, courses and frameworks to support the development of coaching skills. The work of Whitmore, largely acknowledged as the originator of business coaching and the GROW model. The work of Mike Pegg who suggests a 5C framework for mentoring conversations. These seem natural bedfellows irrespective of the label given to the thinking partnership and continue to shape my practice. Newly trained coaches who value the support of a simple aide-memoire as they embed their skill and build experience. 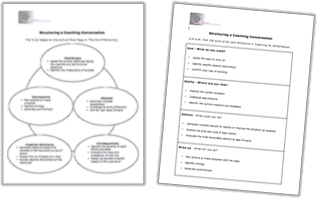 More experienced coaches looking for an alternative to GROW if this doesn’t work for their client, or who want to broaden their repertoire of coaching approaches. Trainers and facilitators who develop coaching skills in others and want to give something to support the transition back to the work place. Workshop attendees looking for their own reminder the coaching process. Three key points to remember for each step. Support for the transition of knowledge to skill and increased competence. Increased confidence in managing coaching conversations.